Shake your bones! Pastoralia was fun but also felt like something deeper, a rediscovery of fundamentals. It soon became clear that Pastoralia wasn’t a literary one-off or a novelty hit but, like wonderfully unpretentious early rock and roll, it was a vital artefact encapsulating an emerging sensibility, a healthy whomp upside the cultural aesthetic. Mr. Saunders’ next four books, The Very Persistent Gappers of Frip (2000), The Brief and Frightening Reign of Phil (2005), In Persuasion Nation (2006), and The Braindead Megaphone (2007), were an idiosyncratic mix of adult fiction, essays, and a bestselling children’s story. Each confirmed the author’s importance, not only as an individual voice but as a general influence; he received glowing reviews and various honors, though none of these books reached the heights of Pastoralia or, for that matter, Mr. Saunders’ first collection of short stories, CivilWarLand in Bad Decline (1996). So it is a happy occasion to be able to say that his latest collection of short stories, Tenth of December, shows the writer in excellent form and will surely rank as one of his best books to date. The opening story, “Victory Lap,” is one of the strongest the author has ever written. Hilarious and alarming, it’s a tale of children in extreme danger that manages to avoid the noxious clichés often accompanying the genre. It’s also a technical marvel, compressing three distinct points of view and individual backstories into a very small space. The bold shifts of consciousness here positively sizzle. George Orwell remarked of James Joyce’s Ulysses that “his real achievement has been to get the familiar on to paper. He dared—for it is a matter of daring just as much as of technique—to expose the imbecilities of the inner mind, and in doing so he discovered an America which was under everybody's nose.” In “Victory Lap” and other stories, George Saunders accomplishes something very similar and he does so without imitating Joycean stream-of-consciousness, which for many writers can result in a faux-lyrical froth. Instead, Saunders’ internal monologues are hyperkinetic, at times explosive. Reading these stories can be like making popcorn with the lid off the pan. “Puppy,” “Al Roosten,” and “Home” are first rate ruminations, simultaneously funny and tragic, recounting the struggles of American families both poor and prosperous. Mr. Saunders writes well about class in a late capitalist economy where some people have it much easier than others but no one is spared. In “Puppy,” two very different mothers’ hopes for their children are horribly miscalculated; in “Al Roosten,” the poisonous effects of resentment spin out of control; in “Home,” a deeply-troubled war veteran struggles to cope with watching his family unravel for reasons that have nothing to do with him. The riveting conclusion of “Home” stands as a challenge to a country still at war. Inevitably, not all the stories are as powerful. A few of them feel like rewrites or outtakes of earlier work. “My Chivalric Fiasco” returns to Mr. Saunders’ now familiar conceit of a theme park employee facing moral dilemmas and beset by family and money pressures. He has handled this material brilliantly before, and in fact created a mini-genre of his own, treating these parks and their approximations as dubious shrines to the pleasure principle, ever poised to run slipshod over others’ woes. This time around, though, the tale seems a bit familiar. “Exhortation” is a brief monologue in the same vein as the sinister faxes in Pastoralia; “Escape from Spiderhead” is a drug-therapy dystopia that echoes earlier stories like “Jon” and “93990” in In Persuasion Nation. “Sticks,” the oldest story in this collection, dating back to the 1990s, is both slight and over-determined, perhaps from a time when the author was less sure-handed. Still, the overall impact of Tenth of December is impressive. The last story, which gives its name to the book, relies on a similar predicament to his 1996 tale “The Falls” but it goes much further, is deeper and more empathetic. A dying, suicidal man named Eber saves a blundering, bullied boy from drowning, and in the process he discovers, at least temporarily, a desire to go on living. Here we have Mr. Saunders in full-blown “single-entendre” mode. Events can be ambiguous, and choices are problematic. But the desire to do the right thing, even the noble thing, is depicted without the slightest nudge-nudge of cynicism. These short stories are full of menace and social breakdown, and yet they announce a faith in the potential for human goodness. Where does this faith come from? It doesn’t arise from a sense of historical process; politics are thin here, and the characters are too harried by life to have time for much analysis. For Mr. Saunders, such faith is no doubt informed by his adopted Buddhism and his Catholic school upbringing. Though irreverent and seemingly agnostic in regard to the supernatural or the divine, much of his work over the last 16 years also evinces a sort of primitive Christianity or at least a fixation with beatific mysteries. 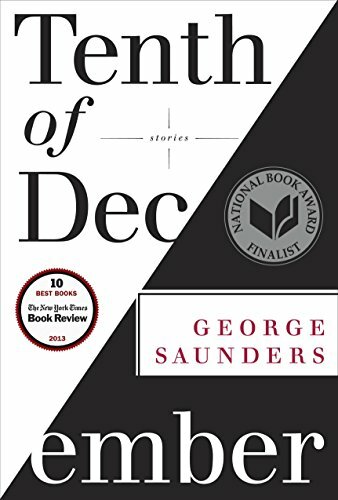 “Tenth of December” is an atypically explicit example: The dying man Eber hears a partial biblical quote of Christ to the criminal on the cross, which ironically spurs him back to fighting for life on this earth. This kind of religious sensibility is a world apart from, say, Flannery O’Connor’s. There is none of the inexorable theology. But there are moments when Mr. Saunders’ writing possesses the crazed animation of an O’Connor character, as if Hazel Motes had the good sense to give up preaching and discovered, to his surprise, a sharp sense of humor and a talent for prose. It’s not as strange as it sounds. Stranger things happen—especially in George Saunders’ stories. Charles Holdefer’s most recent novel is Back in the Game. He teaches in the English Department of the University of Poitiers, France.